There is nothing quite like walking through a mature, open grove of running bamboo. Various running bamboos are suitable for use as specimen groves, evergreen privacy screens, windbreaks, noise/dust barriers, groundcovers, and erosion control. In general, running bamboos are more cold-hardy than the clumping varieties, and may be used to create a tropical feel in an otherwise temperate climate. As stated earlier, before planting any running bamboo, the issue of containment needs to be well thought out. The easiest way to control a running bamboo is by keeping a mowed path all the way around the planting. 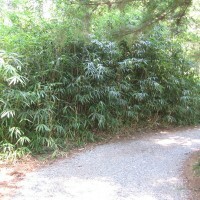 This path should be at least as wide as the maximum potential height of the chosen bamboo in the particular location. Of course, this is not always possible, and containment options will vary by site. 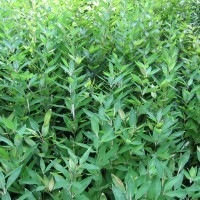 Other methods of containing running bamboos include rhizome barriers and rhizome pruning, both of which require active management to be successful. Permanent bodies of water and deep shade may also serve as natural barriers. The maximum height, maximum cane diameter, and minimum temperature specifications given for individual bamboos are not absolutes. 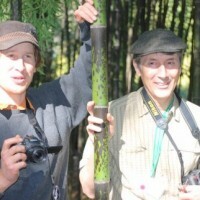 Maximum height and cane diameter listings are approximations of the potential of a given bamboo under optimal conditions. In most situations, a given bamboo will not attain these numbers. The minimum temperature listed is an approximation of the temperature at which leaf damage will begin to occur on a well-established bamboo (first-year plantings usually exhibit less cold-hardiness). Below this temperature, the bamboo may suffer moderate to severe foliage damage, becoming partially or completely deciduous. Usually a given bamboo will survive temperatures well below those listed, generating new foliage and shoots during the subsequent growing season. Protected microclimates sometimes allow a given bamboo to remain evergreen several degrees below its “minimum temperature.” Regarding the sunlight requirements, this may vary across regions, and is only intended as a general guide. Except where personal experience has indicated discrepancies, the figures listed here are taken from the American Bamboo Society’s listed specifications. Indocalamus tessellatus 7 0.5 0 4 Largest leaves of any bamboo in cultivation, giving it great ornamental value. 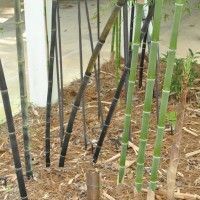 A great bamboo to use near ponds or other water features. Also makes a good container plant and does well in part sun to full shade, making it very versatile. Excellent for use as a low screen or for erosion control. Indocalamus latifolius 10 0.5 -5 3 Similar to I. Tessellatus, but with slightly smaller leaves and a more upright appearance. Excellent bamboo for a low screen. Mini Fern Leaf Pleioblastus disticus 'Mini' 1 0.2 -5 3 This is the shortest bamboo we grow. Makes a wonderful groundcover. Dwarf Whitestripe Pleioblastus fortunei 4 0.2 -10 2 One of our favorite groundcovers, fortunei has beautiful silvery-variegated foliage and is a great choice for brightening up shady spots. Pygmy Bamboo Pleioblastus pygmaeus 2 0.1 8 3 Probably the most common groundcover bamboo. Attractive, lush, all-green foliage. Dwarf Greenstripe Pleioblastus viridistriatus 3 0.3 0 2 Spring foliage is golden-yellow with green stripes. Another great choice for brightening up a shady spot. Pleioblastus viridistriatus 'Chrysophyllus' 3 0.3 0 2 Same as P. viridistriatus, but without the green stripes. Sasa palmata 7 0.5 -5 2 Large leaves give palmata a tropical look. Very popular and also good in containers. A vigorous runner. Sasa tsuboiana 6 0.3 10 2 Similar growth habit to Sasa palmata, but slightly shorter. Very vigorous grower for us. Its vigor and size make it a great choice for erosion control. White Margin Bamboo Sasa veitchii 5 0.3 0 2 Veitchii is a popular groundcover. Foliage develops pseudovariegation around the edges during the fall, giving it a unique look. Another great choice to brighten up a shady spot. 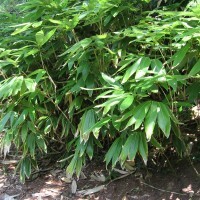 However, veitchii is slower to establish than other similar size bamboos. Sasaella masamuneana 6 0.3 0 3 Attractive dark green foliage. One of our favorite tall groundcovers. Dwarf Variegated Bamboo Sasaella masamuneana 'Albostriata' 6 0.3 0 3 Another favorite groundcover. 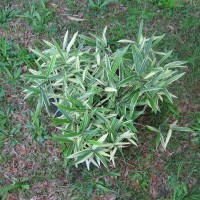 Creamy-variegated foliage. Can take more sun and seems to be more vigorous than Pl. fortunei . Ruscus Leaf Bamboo Shibataea kumasaca 7 0.3 -10 3 A great tall groundcover with unique foliage. Prefers acid soil. 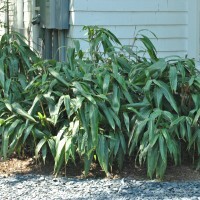 Lance Leaf Bamboo Shibataea lancifolia 7 0.3 -5 3 Similar to Sh. kumasaca above, but with longer, narrower leaves. 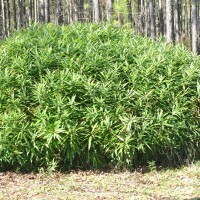 One of our favorite tall groundcover/shrub-height bamboos. Macon River Cane Arundinaria gigantea 'Macon' 20 1 -22 5 River cane is the largest of the three North American native bamboos. Native to low woods and riverbanks east of the Appalachians, west to Missouri, up the Mississippi River Valley to southern Illinois and up the Ohio River Valley to southern Ohio. A great choice for native habitat restoration, River Cane once covered large areas in its range, forming extensive "canebreaks". The 'Macon' clone is more upright and hardier than the species. Switch Cane Arundinaria tecta 8 0.5 5 One of three North American native bamboos, Switch Cane is generally shorter in stature and less cold-hardy, but has larger leaves than River Cane. Its native habitat is primarily moist sites of the Coastal Plain of the southeast from southern Maryland to Alabama and Mississippi. A great choice for native habitat restoration, Switch Cane once formed extensive "canebreaks" in its native range. Switch Cane is much more common than River Cane in our area. Chinese Walking Stick Chimonobambusa tumidissinoda 20 1.3 10 3 A beautiful, rare ornamental with prominent nodes and fine foliage. Needs a moist, shady site in the Deep South. Shiroshima Hibanobambusa tranquillans 'Shiroshima' 16 1.3 0 4 Beautiful, variegated foliage with cream, pink, and green tones. One of our favorites. Does well in sun or shade. Golden Bamboo Phyllostachys aurea 35 2.5 0 5 This is the most commonly cultivated bamboo in the U.S. Makes a very thick, low-branching, evergreen screen. Good-quality wood and ornamental canes with compressed basal nodes. Used for walking sticks, umbrella handles, and fishing rods in China. Inversa Phyllostachys aurea 'Flavescens Inversa' 27 1.8 0 5 Same as P. aurea, but with green canes/yellow groove. Golden Golden Phyllostachys aurea 'Holochrysa' 27 1.8 0 5 Canes are more golden than the species. Koi Phyllostachys aurea 'Koi' 27 1.8 0 5 Same as P. aurea, but with yellow canes/green grooves giving it a unique, ornamental appearance. Green Groove Phyllostachys aureosulcata 'Spectabilis' 26 1.5 -10 5 This is the most attractive of the P. aureosulcata varieties. Yellow canes with a green groove. Canes hold their color well and have beautiful foliage. Handles windy sites better than Yellow Groove Bamboo. Highly recommended. Japanese Timber Bamboo Phyllostachys bambusoides 72 6 5 5 One of the largest bamboos that grows in our area. Very hard wood is suitable for many uses. Slow to size up but worth the wait if you're after quality bamboo poles! This is the most used bamboo in Japan. Slender Crookstem Phyllostachys bambusoides 'Slender Crookstem' 60 3 0 5 As its name implies, many canes will exhibit a slight zig-zag in their lower nodes, making Slender Crookstem an excellent choice for a specimen grove. Also seems to be a more vigorous grower than standard P. bambusoides and can attain similar height with the same excellent wood quality. Tanakae Phyllostachys bambusoides 'Tanakae' 5 Another of our favorites, Tanakae has purplish-brown spotting on green canes. The spotting is very ornamental and older canes eventually turn mostly black. Like all of the P. bambusoides varieties, Tanakae has high-quality wood. 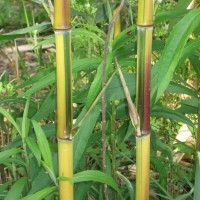 Tanakae can be used as a substitute for black bamboo on hot, dry sites where black bamboo will not thrive. 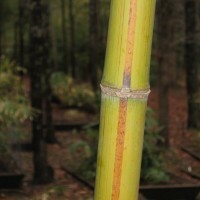 Tanakae is also more erect-growing and more vigorous than black bamboo, which tends to have a leaning habit. Bisset's Bamboo Phyllostachys bissetii 40 2 -15 5 One of the most cold-hardy bamboos and one of the most popular for creating green screens in cold climates. Dense, dark green foliage. Sweetshoot Bamboo Phyllostachys dulcis 40 2.8 0 5 Very ornamental, relatively quick to size up, and high-quality edible shoots. 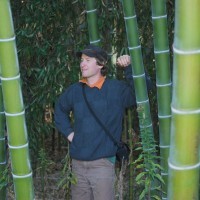 Canes achieve larger diameter in relation to height than other Phyllostachys. Highly recommended for edible shoots and ornamental value, but wood quality is inferior. Anderson Moso Phyllostachys edulis 'Anderson' 75 7 0 5 Moso is the largest of the hardy bamboos and is the most used bamboo in China. Slow to size up but worth the wait. Very high-quality wood and a very beautiful bamboo. The 'Anderson' clone is more cold-hardy than the species. Moso Phyllostachys edulis 75 7 -6 5 Moso is the largest of the hardy bamboos and is the most used bamboo in China. Slow to size up, but worth the wait. Very high-quality wood and a very beautiful bamboo. Black Bamboo Phyllostachys nigra 30 2 0 5 Black bamboo is the most popular of the taller running bamboos. New canes turn black after 6 months to a year. Good quality wood and very ornamental. Excellent choice for a specimen grove but prefers light shade and ample moisture in the Deep South. 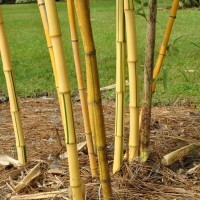 For hot, dry sites, P. bambusoides 'Tanakae' can be a good substitute for black bamboo, as its canes will eventually turn black. Giant Gray Phyllostachys nigra 'Henon' 65 4.5 0 5 A very beautiful bamboo, probably the mother form of black bamboo. Canes have a grayish hue. Extremely drought-tolerant. One of the best overall for a specimen grove and good wood quality. Megurochiku Phyllostachys nigra 'Megurochiku' 54 3.5 0 5 Similar to Henon, but canes have brown grooves. Megurochiku is a rare and much sought-after bamboo. Red-Margin Bamboo Phyllostachys rubromarginata 55 2.8 -5 5 Rubromarginata is a very vigorous grower, and is tolerant of cold, dry winds. Tests in Alabama have shown it to be superior in cane production. Good quality wood and edible shoots. Excellent screening bamboo. Highly recommended. Robert Young Phyllostachys viridis 'Robert Young' 40 3 -5 5 A very popular, cold-hardy ornamental. Beautiful yellow canes and random green striping. Good quality wood and very drought-tolerant. Vivax Phyllostachys vivax 70 5 -5 5 Similar to P. bambusoides, but quicker to size up and more ornamental with nicer foliage. However, canes are thin-walled and wood quality is inferior. Golden Vivax Phyllostachys vivax 'Aureocaulis' 70 5 -5 5 Another of our favorites. Same as Vivax, but with golden canes and random green striping. One of the best choices for a large specimen grove. Tonkin Cane Pseudosasa amabilis 50 2.5 15 5 Very beautiful, tropical look. Great bamboo to plant as a specimen grove. This is the bamboo used to make high end fly-fishing rods. Good-quality wood. Arrow Bamboo Pseudosasa japonica 18 0.8 0 5 Arrow bamboo is a great cold-hardy screening bamboo with a tropical look. Less aggressive than other tall runners, can take sun or shade, and makes a great container plant. Also wind and salt-tolerant. Green Onion Bamboo Pseudosasa japonica 'Tsutsumiana' 18 0.8 0 5 Similar to Arrow Bamboo, but with swollen internodes shaped somewhat like a green onion. Good container bamboo and also a good screening choice. Less aggressive than other runners. Temple Bamboo Semiarundinaria fastuosa 30 1.5 -5 5 Very erect canes turn purplish or reddish in the sun. Good-quality wood and a very beautiful bamboo. Handles salt spray well. Makes an excellent specimen grove, but is slow to establish. Semiarundinaria okuboi 25 1.5 0 5 Excellent screening bamboo and a very vigorous grower. Sinobambusa tootsik 'Albostriata' 30 1.5 10 5 Erect canes and variegated foliage. Highly recommended for warmer climates. 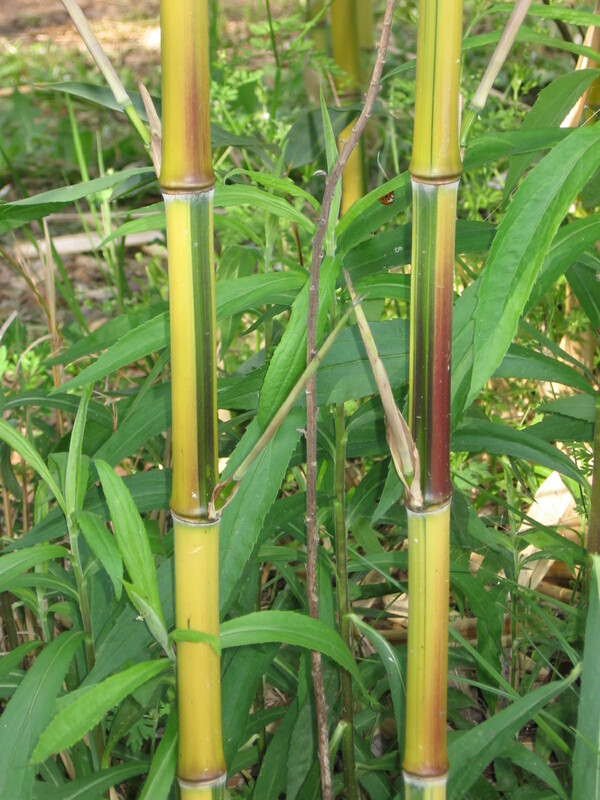 Hill Cane Arundinaria appalachiana (Hill Cane) Hill cane is the smallest of the three North American native bamboos. Native to slopes and upland woods of the southern Appalachians, usually away from streams and rivers. Deciduous in its native habitat – we are testing its performance here. Variegated Marbled Bamboo Chimonobambusa marmorea 'Variegata' 6 0.5 16 New shoots are marbled in appearance. 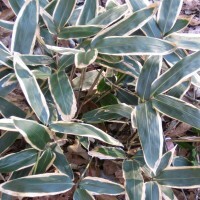 Variegated foliage. A beautiful and unique small bamboo. Fall-shooting. Indocalamus solidus 8 0.4 -5 Solid canes. Excellent bamboo for a low screen. Indocalamus longiauritus 5 0.3 -5 Shortest Indocalamus and with smaller leaves than other Indocalamus species. Pleioblastus argenteostriatus 3 0.3 10 Variegated spring foliage fades through summer/fall. Pleioblastus chino 10 0.8 10 Medium size bamboo native to Japan. Pleioblastus chino 'Murakamianus' 10 0.8 10 Highly variegated foliage. Pleioblastus gramineus 12 0.5 10 Long, narrow leaves are grass-like in appearance. Pleioblastus humilis 'Variegatus' 4 0.1 0 Another of our favorite shorter bamboos. Highly variegated foliage. Has done very well for us in open shade. Pleioblastus pygmaeus 'Ramosissimus' 6 0.1 0 Taller and hardier than the species. Pleioblastus shibuyanus 'Tsuboi' 9 0.3 -5 This bamboo has a very unique look and form. 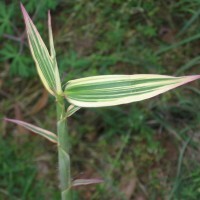 Variegated foliage. Sasa veitchii 'minor' 1 0.3 0 A shorter clone of Sasa veitchii. Sasamorpha borealis 6 0.3 -10 Very cold-hardy and beautiful foliage. Square Bamboo Chimonobambusa quadrangularis 25 1.5 15 4 Canes are square in cross secton, more evident in larger canes. Chimonobambusa quadrangularis 'Suow' 25 0.5 15 4 Same as Square Bamboo, but with yellow canes/green stripes. Stone Bamboo Phyllostachys angusta 22 1.3 0 5 The common name comes from the hardness of its wood. Used to make fine bamboo furniture in China. Also used for weaving and for making fishing rods. Incense Bamboo Phyllostachys atrovaginata 35 2.8 -15 5 Very cold-hardy and one of the few Phyllostachys adaptable to wet sites due to air channels within its rhizome. Upright growth habit. The common name originates from the slight smell of incense that results from rubbing the canes. Used as timber in China. Yellow Groove Phyllostachys aureosulcata 45 2.2 -10 5 One of the more cold-hardy bamboos and fairly common further north. 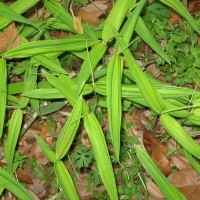 Green canes with a yellow groove and occasional zig-zags in lower sections of some canes. Phyllostachys aureosulcata 'Aureocaulis' 26 1.5 -10 5 Similar to the species, but shorter and with yellow canes. Phyllostachys elegans 32 2.3 0 5 Highly regarded for quality shoots and very ornamental. Erect-growing. Solidstem Phyllostachys heteroclada 'Solidstem' 24 1.3 0 5 Another Phyllostachys that is suitable for wet sites due to air channels within its rhizome. Lower portions of the canes are almost solid and many also have compressed basal nodes, giving it ornamental value. Excellent screening bamboo. Phyllostachys humilis 20 1 0 5 Possibly the shortest-growing Phyllostachys. Useful for smaller gardens where large bamboos won't work. Phyllostachys iridescens 40 2.8 0 5 Some lower internodes have yellow striping. Sweet shoots and quality wood. Leopard-Skin Bamboo Phyllostachys nigra 'Bory' 50 3 0 5 Canes have black spotting, never completely black. Grows larger than black bamboo. Punctata Phyllostachys nigra 'Punctata' 60 4 0 5 A larger form of Black Bamboo. Shimadake Phyllostachys nigra 'Shimadake' 54 3.5 0 5 Similar to Henon, but with random brown vertical striping on canes. Has been much slower-growing than Henon for us. Phyllostachys nuda 34 1.8 -20 5 Reported to be the most cold-hardy of the Phyllostachys, but is not tolerant of cold, dry winter winds. High-quality wood. Phyllostachys violascens 20 2 0 5 New canes are blackish-violet, sometimes striped with violet. Pleioblastus juxianensis 15 1 10 One of the tallest of the Pleioblastus genus. Used for making umbrella handles in China. Pleioblastus simonii 20 1.5 0 4 Very erect with clustered branches and beautiful foliage. Canes make wonderful garden stakes. Pleioblastus simonii 'Heterophylla' 20 1.5 0 4 Variegated form of Pl. simonii.